Working with the sea turtle program, I feel lucky to spend my mornings patrolling Osa’s picturesque beaches looking for nesting sea turtles. 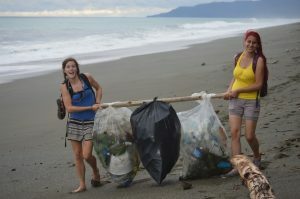 However, one feature that can often distract from the beauty of these beaches is the presence of plastic waste that still finds its way to the coastline. While this pollution is unsightly, more importantly, it’s harmful to wildlife. Despite ongoing beach clean ups, plastics can accumulate on our beaches because it washes up with the tide. What doesn’t make it to shore likely gets caught up in one of the several massive gyres of trash floating in the world’s ocean. Because plastic is non-biodegradable, these gyres are forever growing. Every single piece of plastic that has ever been produced still exists in some form. It may break down into tinier pieces, but it will never disappear. Sea turtles are particularly susceptible to the dangers from marine plastic. 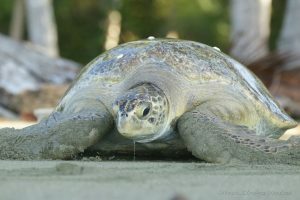 Throughout the oceans, sea turtles are commonly found tangled in discarded fishing nets, unable to swim for food or air. Some turtle species that rely on jellyfish for food, such as the endangered leatherback, mistake floating plastic bags for this prey. Sea turtles are unable to digest the plastic they eat, so it accumulates in their gut and creates deadly blockages. As more and more plastic pieces enter the ocean, it’s becoming impossible for turtles to avoid consuming it. 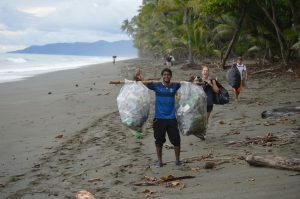 While our efforts to complete beach clean-ups in the Osa make an important difference in reducing the plastic in these ecosystems, there are many ways that the average person can also help prevent the plastic from arriving in the first place. Consider the waste that you create in a day – how much of it is plastic? Bottles, bags, packaging… likely all plastic! One small lifestyle change people can make to reduce their plastic waste and help protect sea turtles is to minimize their use of single-use plastics. This includes things like packaging of individually wrapped snacks. Instead, buy in bulk and store your purchase in your own container; carry reusable water bottles and shopping bags; ask for your drink without a straw at a restaurant; carry silverware in your bag to avoid plastic cutlery. Remember to ask yourself: While it may be more convenient for a moment, is it worth endangering wildlife and polluting the planet for eternity? Help us protect sea turtles and minimize the plastics that make their way to our oceans.